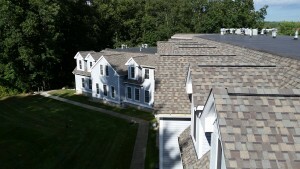 Keep your family and your home safe by choosing South Shore Roofing for all of your residential roofing needs in Cohasset, Massachusetts and the surrounding area. Anyone can purchase the tools needed for the job at hand, but only a licensed and insured residential roofing contractor has the training needed to get the job done right the first time. A residential roof must be functional and appealing as well. Choosing a contractor for any type of repair work is an important decision for any homeowner. You have a great deal riding on this type of work, and you can’t afford to gamble with such a choice when the well-being of your family is at stake. Make our roofing company your partner for all of the residential roof construction work you need. When you don’t have money to waste on contractors who constantly need second chances to get the same project right, our team is there to get the job done right the first time. We understand that your roof is a valuable asset that can seriously harm your budget if work is done sloppily. We take the time to listen to your needs, and work to complete the project on time, to you can get back to the business of living. Roofing repairs and restorations can be complicated affairs, so it makes sense to hire a residential roofing contractor who takes the time to listen to their clients. We explain everything we do for the homeowner in detail, so they never feel like they are being taken for a ride. The roof over your head can be sturdy and stunning, but only if you choose the right roofing specialist for your next project. Resolve any problem with your roof right away, and stop worrying about that slow leak in the attic. The longer you postpone any repair project, the greater risk there is for an infiltration of rot and wood destroying insects. Improve the curb appeal and resale value of your home with relative ease by making our team part of your planning. Avoid the embarrassment involved with blue tarps over your home by choosing the right contractor for residential roof construction. If you are building a new home that you need to last for generations to come, the right move is hiring a contractor with the right tools and decades of roofing experience. Take advantage of our depth of knowledge when it comes to the different types of roofing materials on the market today. Our team is periodically trained to reinforce standard roofing practices, and our company carries liability and workers comp insurance for your protection. Don’t be left holding the bag for any type of accident at your home. When you face storm damage at your place of business, just contact us for commercial roof repair as well. Contact us today for a stronger and safer home through our approach to residential roof repair. We proudly serve customers in Massachusetts, particularly on the South Shore, and accept credit cards and offer financing through a third party.